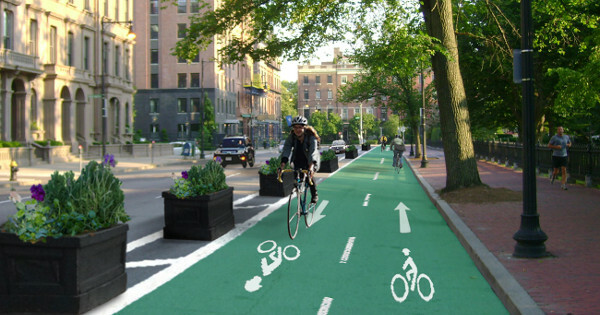 A rendering of a protected bike lane being used by Charlotte biking advocates to explain the idea. Rendering by Jessi Flynn. On Monday, a massive petition and letter-writing campaign helped make Charlotte the latest city to set a downtown protected bike lane effort in motion after 3,000 people contacted the city council to express their support for the idea, which could seamlessly link Charlotte’s Irwin Creek Greenway and Little Sugar Creek Greenway paths to one another and to central-city destinations. It’d be a textbook use of protected bike lanes to close a gap between other parts of a city’s high-comfort network. In a city whose population understands networks — how the value of every point on a network rises exponentially as networks grow — that’s evidently something lots of Charlotteans can get behind.